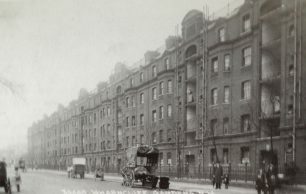 Sylvia Hawkes, a lingerie model, Cochran dancer and actress, and one of the loveliest girls in London, was the daughter of Arthur Hawkes, a livery stable employee who lived on the estate. On 2 February 1927, she married Lord Ashley, son and heir of the 9th Earl of Shaftesbury, much to the horror of his parents and the excitement of the Press. 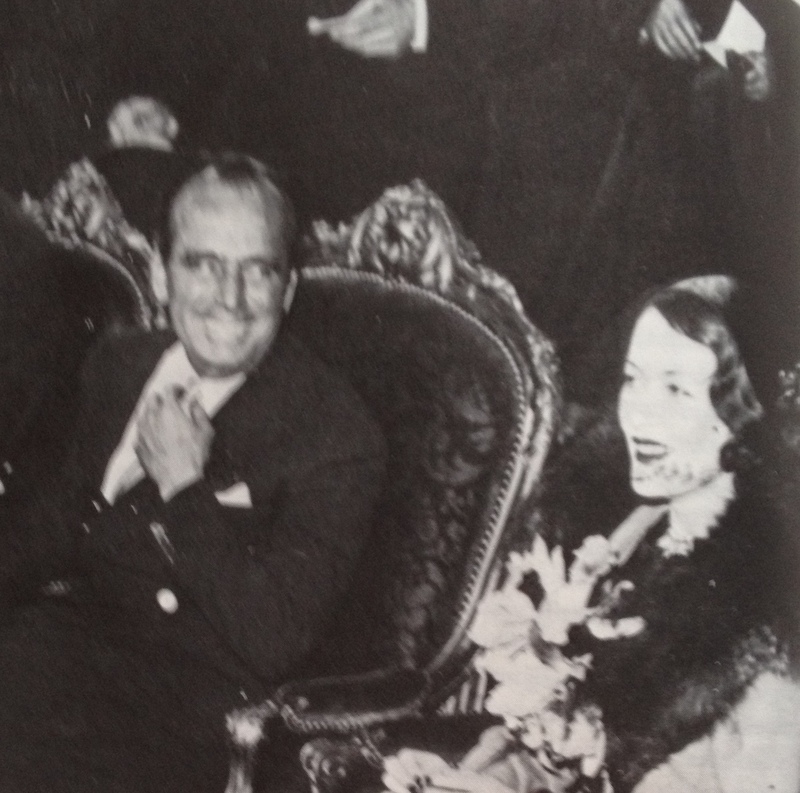 A few years later, she left him, having met film star Douglas Fairbanks Snr, then married to film star Mary Pickford. In 1934, Lord Ashley sued for divorce, citing Fairbanks. Eventually Fairbanks and Pickford divorced, and Sylvia married Fairbanks in 1936. Fairbanks died at the beginning of the Second World War and left Sylvia the bulk of his estate. In 1941, she established a charity in Los Angeles to help refugees in the war. Her marriage to Edward, 6th Baron Stanley of Alderley, ended in divorce and then in 1949 she wed the film star Clark Gable. This marriage did not last long and finally she married Prince Dmitri Djordjadzo, and died in 1977. Sylvia’s father, Arthur Hawkes still lived in Wharncliffe Gardens after the War, tired and sick and with a small pension; he had latterly been a porter in a block of flats and doorman at a restaurant. 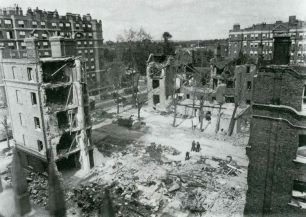 33 people were killed, 38 were seriously wounded and 107 had minor injuries after the flying bomb cut out above the estate on 21 August 1944. It landed at 8.18 p.m.and by 8.45p.m. six heavy rescue parties, three light rescue units and ambulances had arrived. By nine o’clock, the first of 3 cranes, 12 skips and 17 tipping lorries had arrived plus listening apparatus and the last body was recovered at 8a.m. on 23 August. The WVS ran an enquiry bureau and provided facilities for workers and residents. Fifty flats were demolished and others were made uninhabitable. My mother, sister and myself had not long had our dinner. We were all sitting in the sitting room in the ground floor flat – at about 8 o’clock our flats had a direct hit from a flying bomb. I ran to the side of the fireplace and my sister followed me when we heard the terrible screech of the bomb. The next thing I knew, I was pinned from my shoulders to my right arm across my chest, my left arm was free and I could just move that and was able to put it out at the side a little way. It seemed a very long time and difficult for me to make a noise, as my mouth seemed full of debris, anyhow I made as much noise as I could and was greatly relieved when I felt somebody get hold of my hand. He said he would come back. After some time I could feel that the wall at the back of me was being loosened and I was able to move the top part of my body. I was gradually dug out with the men taking turns to release me. There was a doctor giving me attention, we were all in a very small space. I had a drink through a tube and was given injections in my arm but was conscious all the time. Finally I was hauled up by ropes, put in an ambulance and taken to Middlesex Hospital. All the flats had to be demolished after the War, and a new council estate was built in the late 1970s, with 4 storey blocks as a reaction to the, by then, unpopular tower blocks. 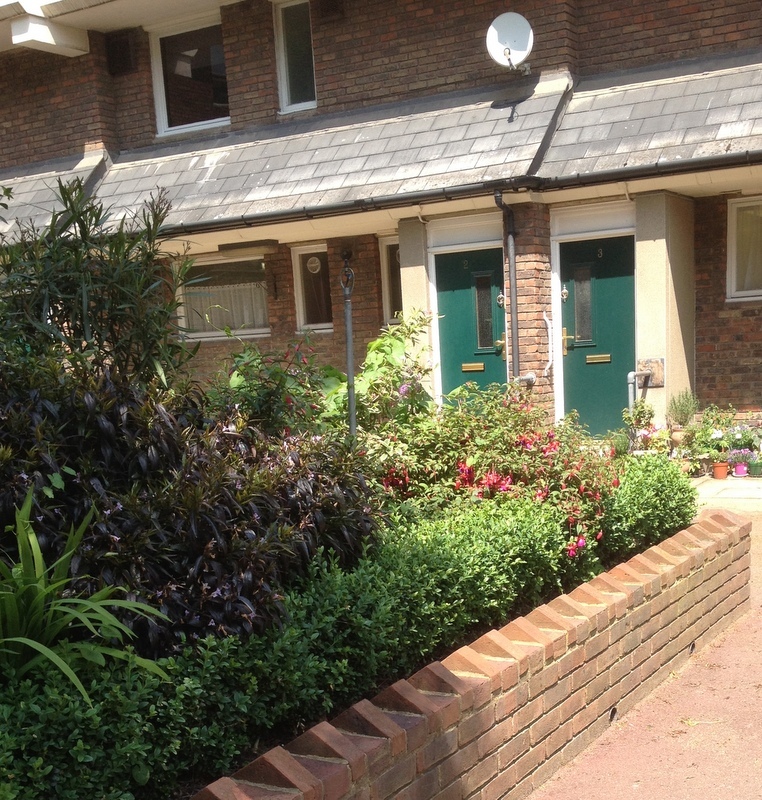 There are 280 homes, 70 of which are suitable for the elderly. 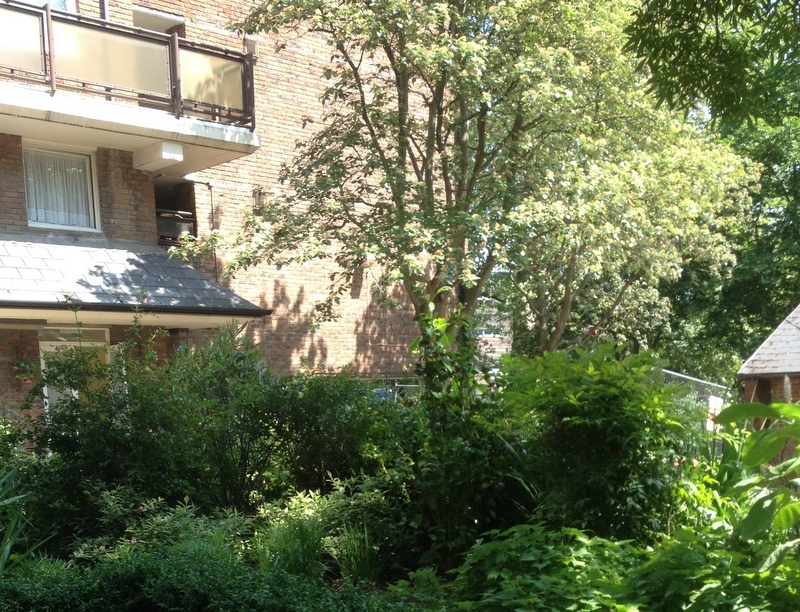 Those on the ground floor have their own front doors and there are small enclosures with some gardens and car parking. 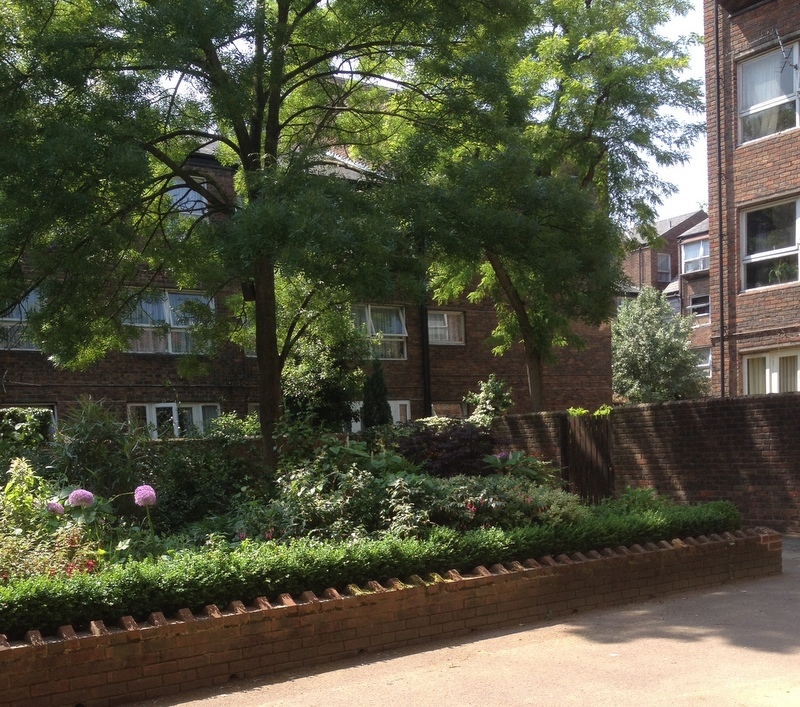 The estate was designed by GMW Partnership and the bricks are an unusual colour for London as there was a brick shortage nationally at the time and bricks had to be brought in from wherever was available. This page was added on 20/03/2016. I remember you Steven – I used to be very friendly with your two elder sisters. Our mums were best friends. We lived on a different block to you though when we moved there in 1955 when I was 3 – firstly a one-bedroomed flat and then when my siblings arrived we were given two-bedroom. Tin bath on a shelf in the 6ft x 6ft kitchen. Remember my mum heating the water in her washing machine and pumping the water into the bath – it was emptied with a big saucepan. Regents Canal, which was teeming with rats, ran along the end of the rows. Happy days they were – couldn’t remember children of different ages – everyone included even if you were only 4 – all playing rounders together now! I went to Gateforth then Gateway primary school – our school merged with Rossway. Left London at 14 for a house with a proper kitchen and bathroom. Still here and settled with family. 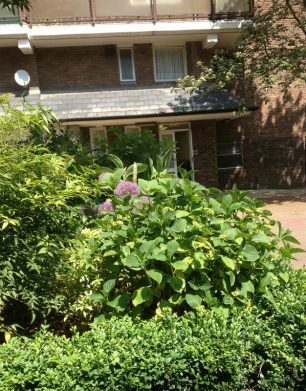 I was actually born in 211 Wharncliffe Gardens in June 1967 before moving to Bedford in late 1969. My parents had originally lived in 206 before moving upstairs (presumably for extra room) when my elder brothers arrived in the late 50s. They both worked for the railways when they married and got the flat through that. 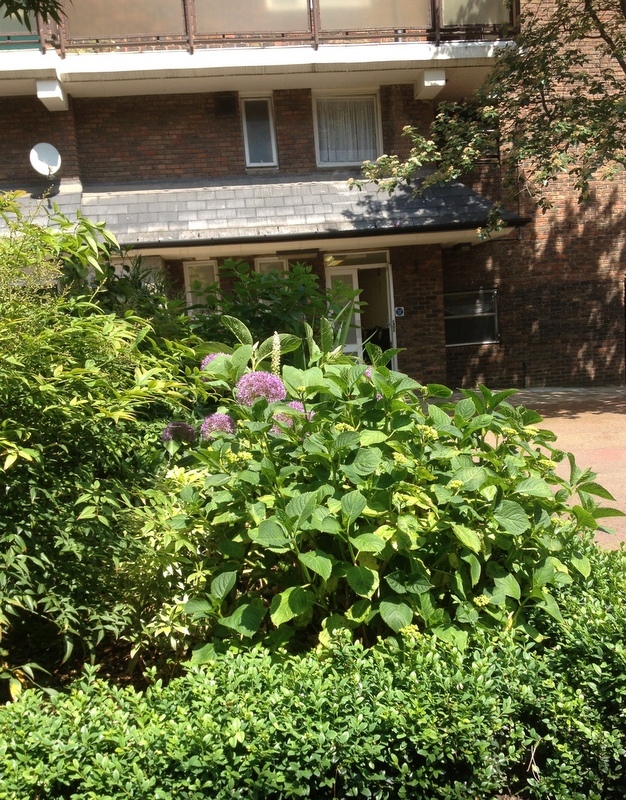 I lived in Wharncliffe Gardens from 1952 -1957, firstly at #449 top floor one bedroom on Cunningham Place. Then when when my brother was born in 1955 we were moved to a ground floor flat, #512 further down the same block opposite The Crown pub. My dad was a fireman and later a driver out of Paddington. I have wonderful memories from my childhood there and can still remember the names of my friends who lived there and attended Gateforth Street School (I was seven when we were re-housed in 1957). 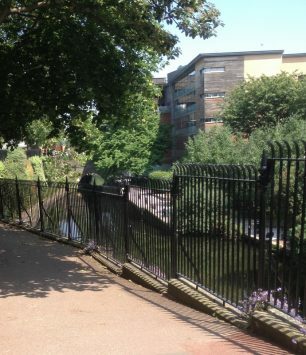 I remember all us kids riding our scooters up and down the slopes by the railings beside the canal. A big treat was my dad taking me up on the roof on his “rest day”. I was fascinated that you could walk among the chimney pots and through gates from one end of block to the other! I cannot remember any three bedroom flats either. Ours was one bedroom where my brother and I slept (and my Dad slept there when he was working nights). and my Mum and Dad slept on the put-u-up couch in the living room. Saturday was bath night and we all bathed in the tin bath on the tiny kitchen floor with water heated on the stove in saucepans by my Mum! Gina, we lived on the top floor number 470 of the block closest to Cunningham Place, one bedroom, no bath, no kitchen,- just a hatch in the hall. I remember the roof and the lovely view down to Little Venice, always felt very posh- the view that is but I was just 4 when we moved in. We moved to Harewood Avenue -Blandford Square, in 1970 and my mum still lives there. Hi Peter, hope you’re keeping well. Yes you’re right, I did spear my upper arm on the roof top railings (good memory). We used to have a fast- track access to Paddington Green Children’s Hospital back in those days. I guess it was because we were always out and about. We lived in a flat in the rebuilt block of Wharncliffe Gdns, opposite the carpenters workshop, near one of the front gates.The spaces between the blocks were our play areas,and the slope along the railings,next to the canal,with the power station on the other side of the canal. I still remember some of my friends Steve McCarthy,David McCarthy,Bruce, and Gerry Winter. Steve, who wrote the first memories, did you spear your arm on the railings, while playing on the roof? – memories from another age. 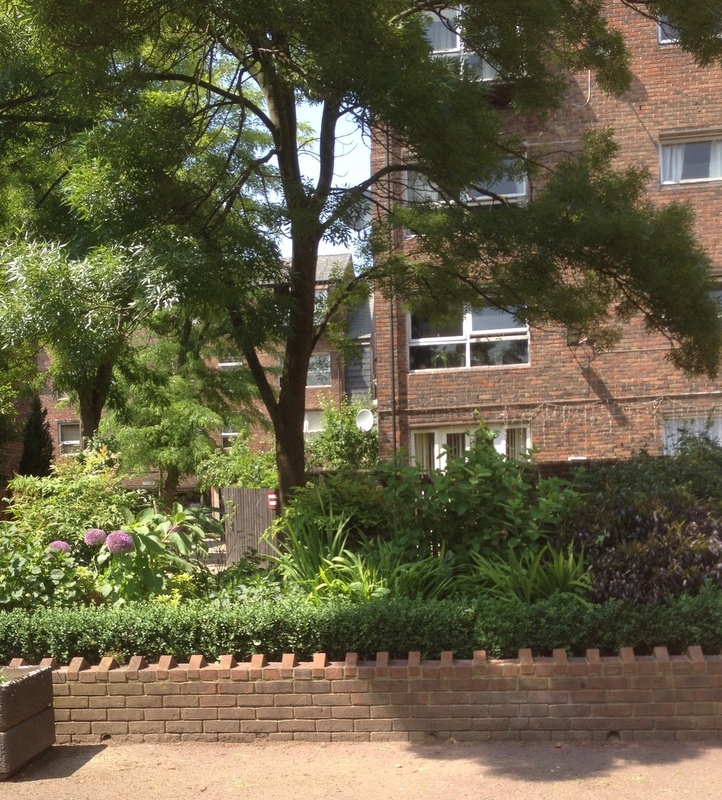 Not quite a description of the Wharncliffe Gardens I remember living in. My grandparents lived at number 365 for over 30 years – leaving in 1966. 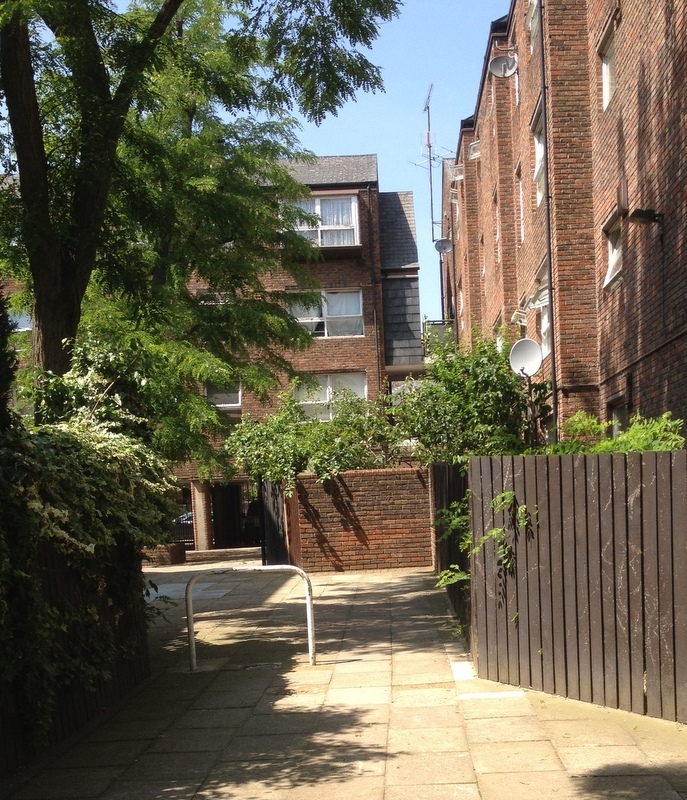 One bedroom flat with kitchen and toilet – had left their ‘slum’ in St Anns Terrace and always talked about “getting their own Front Door”. Each block had a series of staircases with three flats on each floor – 5 stories. My parents lived with them when they first married,1951, moved to a shared house in Notting Hill before returning to WG in 1957. 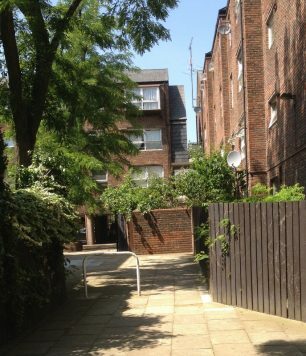 That was 2 blocks across, closer to Lisson Grove, at no. 147, the first entrance from the canal end,- front door opened onto a passageway (loo at end) where we had a kitchen dresser and cooker. Living room with sink, could be closed off with a sliding wooden door, and one bedroom. 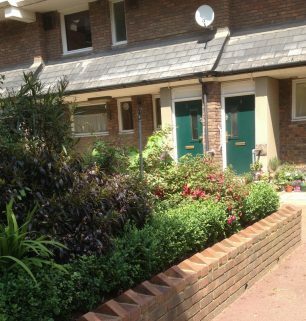 In 1962 we moved “up the block” to no.191 -2 beds and a kitchen as well as a loo. My Mum was quite ill and asked to be rehoused in one of the new flats. Following the bombing in 1944 – whilst the destroyed blocks had been replaced our block had the end closest to St Johns Wood Rd rebuilt. In 1967 we moved to one of the new flats no. 228. Top floor, end entrance 2 beds, living room, kitchen and bathroom. 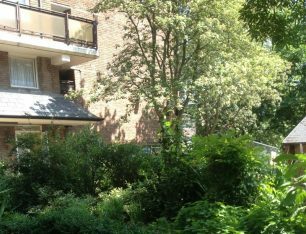 We stayed there until everyone was moved out when I was 17.My parents had a choice – Lisson Green, a highrise off Marylebone Rd or Blandford Sq, Harewood Ave which is where we moved to in 1971. Never met anyone who had a 3 bed flat in all the time we lived there. Sir Joseph William Bazalgette, C.B.